In his deep distraught of being asked to leave the MB Kedah, Dato’ Seri Mukhriz Mahathir decided to give a low blow and issued a statement which draw the fundamental question; Did he get the authority to speak on behalf of His Majesty? 31 JANUARY 2016 @ 5:01 PM ALOR STAR: Embattled Kedah Menteri Besar Datuk Seri Mukhriz Mahathir is showing no signs of backing down, despite facing a revolt from within Kedah Umno. In a strongly-worded statement issued today, Mukhriz described the actions of 12 division chiefs and two deputy chiefs in “dragging” the Youth, Wanita, and Puteri wings chief and young leaders within Umno, to the press conference on Jan 20 as irresponsible. “As a matter of fact, several of those present said that they were not informed beforehand the purpose and contents of the statement made. “I believe that the pressure (in calling for me to be sacked as Menteri Besar and state Umno chairman) does not represent the majority voice of Umno members, and more importantly, the people of Kedah,” he said. Mukhriz said the actions of the group, who had called for his removal, had also cast a shadow on the various celebrations held in conjunction with the birthday of the Sultan of Kedah. Mukhriz also asked that the 14 party division chiefs, whether directly or indirectly involved with the press conference on Jan 20, and the six state executive councillors who were absent from the meeting, to apologise to the Sultan of Kedah and the council members. “Until this crisis is resolved, all state executive councillors and state assemblymen have to carry out their responsibilities they have been entrusted with,” he stated. The rice bowl state has been plunged into crisis, following a declaration by state Umno leaders, led by Kedah Umno deputy chairman Datuk Seri Ahmad Bashah Md Hanipah, that they had lost confidence and faith in Mukhriz’s leadership as MB and state Umno chairman, and asked for an immediate change. This defiance would not stop the fact that Mukhriz is on the way out. 14 of out 15 UMNO Division Chiefs want him out. 19 ADUNs signed SD to state that they no longer support him as MB, which translate of losing majority control of DUN. It is no secret that the power civil servants of Kedah Civil Service (KCS) no longer co-operative with Mukhriz as Mentor Besar. And the nail to the coffin, on Friday after MT UMNO meeting party President Prime Minister Dato’ Sri Mohd. Najib Tun Razak said the Council of Regent accepted all nominees for the next MB. Prime Minister Najib also did have the audience His Majesty for the matter already. It means that the matter was sought to be resolved through the proper channels. It is expected that Mukhriz had to be dragged out with his feet kicking around. However, the baffling question is did Mukhriz obtain authority to use the phrase “Turut murka”? Raja Petra asked the paramount question of ‘Save Kedah or Save Mukhriz?’. Menteri Besars being asked to leave prematurely isn’t something new. Tun Dr. Mahathir Mohamad himself 20 years ago got then Tan Sri Osman Aroff to go and installed then Dato’ Seri Sanusi Junid instead. Bekas Menteri Besar Kedah, Tan Sri Osman Aroff yang ‘diundurkan’ daripada jawatannya pada tahun 1996 meminta Datuk Seri Mukhriz Mahathir akur dengan keputusan parti mahu menggantikannya dengan pemimpin lain. Beliau yang digantikan dengan Tan Sri Sanusi Junid oleh Perdana Menteri ketika itu, Datuk Seri Dr Mahathir Mohamad juga minta pihak yang terbabit tidak mengaitkan krisis UMNO Kedah sekarang dengan pihak istana. Menteri Besar Kedah keenam itu menyarankan semua yang terbabit akur dengan pendirian parti yang sudah membuat keputusan berhubung kedudukan Mukhriz. Osman berkata, beliau pernah mengalaminya apabila Dr Mahathir selaku Presiden UMNO ketika itu mahukannya meletakkan jawatan walaupun dipertahankan oleh 22 Ahli Dewan Undangan Negeri (ADUN) Kedah. Katanya, ketika itu pihak istana tidak pernah campur tangan dan terus berkecuali sehingga isu selesai dengan pengundurannya atas dasar mengikut arahan ketua. “Di pihak mana sekali pun, jangan guna nama istana kerana setahu saya istana tidak pernah masuk campur dalam urusan politik seperti ini. Sultan Kedah (Tuanku Abdul Halim Mu’adzam Shah) tidak pernah ikut campur hal politik, baginda berkecuali,” katanya. Beliau juga berkata, Kedah berdepan masalah jika Mukhriz terus kekal Menteri Besar tanpa mendapat sokongan dan dokongan parti. Justeru, beliau minta Presiden UMNO, Datuk Seri Najib Razak segera membuat keputusan bagi menjernihkan kembali keadaan dengan tidak membiarkan kemelut politik negeri berpanjangan. “Parti di peringkat negeri sudah membuat pendirian hilang kepercayaan kepada pimpinan mereka. Perdana Menteri tidak boleh bertangguh lagi kerana keadaan boleh jadi lebih buruk jika perkara ini dibiarkan berpanjangan. Najib perlu buat keputusan segera. “Apa yang jelas di sini, jika Menteri Besar kekal tanpa sokongan parti yang mendokongnya, maka pentadbiran negeri Kedah akan berada dalam masalah. Jika bermasalah bagaimana pentadbiran akan berjalan dengan lancar,” katanya. Sementara itu, beliau membidas dakwaan kononnya Barisan Nasional (BN) akan kalah pada Pilihan Raya Umum (PRU) akan datang jika Mukhriz disingkirkan kerana berpendapat keputusan PRU berdasarkan gerak kerja parti untuk mendekati rakyat. “Untuk kata muktamad BN akan kalah pada pilihan raya, …itu tidak adil. Kita tidak boleh kata kemenangan itu disebabkan seseorang semata-mata kerana seluruh jentera buat kerja untuk mendapatkan undi rakyat. Recently Tan Sri Khalid Ibrahim and Dato’ Sri Ahmad Said saw the same fate. Of course they were deeply displeased and even slighted badly. However, their defiance did not reach to the level of speaking on behalf if HRH Sultans of the respective state. Let us hope the defiance would not lead to something that Anwar Ibrahim did and would repeat, is he is in the position today. Despite Attorney General Tan Sri Apandi Ali’s landmark pronouncement on closure of on Tuesday the USD620million ‘donation’ from a Saudi Royal to Prime Minister Dato’ Sri Mohd. Najib Tun Razak and drama that follow suit, it is still unsettled. The Malaysian social media is still cluttered with more of these noises and the intensity of them being echoed is staggering. It is a sign of desperation by the detractors who are kicking themselves for how situation turned out against their game. It is unsure whether these foreign law enforcement agencies did take necessary steps to get the co-operation of the AG and the various different authorities which are eye balling the case involving the controversy created on and about 1MDB. By far, that added confusion warrants more statements for clarifications, required to be issued today. 1MDB was also quick to reiterate their position about no foreign authorities ever got in touch with them for any form of queries or investigations. 1MDB refers to a statement issued by the Office of the Attorney-General of Switzerland on Friday 29 January 2016 relating to an on-going investigation. As we have previously stated, 1MDB has not been contacted by any foreign legal authorities on any matters relating to the company. 1MDB remains committed to fully cooperating with any lawful authority and investigation, subject to advice from the relevant domestic lawful authorities, and in accordance with international protocols governing such matters. It is quite baffling if there are any investigations by foreign law enforcement authorities, why none of them have made the necessary queries through the usual proper channels? Yet, the Neo Con Jewish controlled foreign media keeps harping on the matter despite some of those which are not aligned to them, have resided to the fact that some of the previously assumed controversies like the USD620 donation is explanable. This prolonged continuation of very distractive noises is counter productive. Especially in the current Malaysian economy despite being fundamentally sound but affected by the volatility of the global economy, which is artificially violated. This noise would also just add to the confusion and causing many to have the ripples quite having the good confidence otherwise, especially from the perspective of corporate governance and the administration of the rule of law. MACC is beginning to look like playing politics after escalating the investigation on the alleged white collar crime involving Prime Minister Dato’ Sri Mohd. Najib Tun Razak, by using the Panel of Operational Review to look at the case which Attorney General Tan Sri Apandi Ali decided to close the matter. PETALING JAYA: There is nothing unusual about referring the Attorney-General’s decision on SRC International and the RM2.6bil cases to two independent panels, said Malaysian Anti-Corruption Commisson (MACC). In a statement, MACC strategic communications director Datuk Rohaizad Yaacob (pic) that the move should not be construed as rejecting the decision made by Attorney-General Tan Sri Apandi Ali. “I would like to stress that our decision to refer to Operational Evaluation Panel (PPO) was a procedure before closing any case. “Therefore, it is normal for this procedure to take place and should not be translated that we rejected the decision made by the Attorney-General,” he said in a statement, Wednesday. Earlier, MACC said that its top management had decided to refer the case to the PPO an independent body set up by the Government to monitor the MACC, as well as another special panel to be appointed. This has given the impression that the anti-graft body chose to refuse the A-G’s directives to close the case and cease investigations, as there was no criminal offence committed by Prime Minister Datuk Seri Najib Tun Razak. However, MACC special operations director Datuk Bahri Mohd Zin had said that the commission would “most likely” consider appealing the A-G to reconsider its decision. But Rohaizad said any statements made by any individuals do not represent MACC’s official stance. It is normal business day for law enforcement agencies such as MACC and the Police to have their investigations asked to be closed after the AG has gone through the case and files. It is learnt that an MACC special panel consist of five prominent Malaysians reviewed the investigation papers on the USD690million donation allegedly credited into PM Najib’s personal account in early 2013. They have given their views and there on, MACC submitted the investigation papers (IP) on the eve of the 2016 New Year. When WSJ broke the story in July, the Opposition, Neo Con Jewish controlled foreign media and PM Najib’s detractors from within were quick to quip that the former is immersed in corruption practices, arisen from mismanagement of 1MDB. AG Apandi when dismissing the case, cited that the Royal Saudi family donated the large sum of money without any attachment to it. Never the less, Malaysians were given the impression that MACC was not pleased with AG’s decision and would look avenues for a recourse. KUALA LUMPUR: The Malaysian Anti-Corruption Commission (MACC) will likely appeal the Attorney-General’s decision absolving Prime Minister Datuk Seri Najib Tun Razak of criminal offences over a RM2.6bil donation and RM4bil Government loan in 2011 to SRC International. Attorney-General Tan Sri Mohamed Apandi Ali earlier absolved Najib of any criminal wrongdoing in relation to the two investigations. Bahri was one of the MACC directors that was transferred to the Prime Minister’s Department on Aug 7, 2015. He was later reinstated to his original post three days later. Apandi had on Tuesday said that documents showed US$681mil (RM2.08bil) was transferred to Najib’s personal accounts between March 22 and April 10, 2013 from the Saudi royal family, and had returned US$620mil (RM2.03bil) in August 2013 as the funds had not been put to use. On the SRC International case, Apandi said there was no evidence that Najib had abused his position during a Cabinet meeting that approved a Government guarantee on the loan from Retirement Fund Inc, a pension fund. That caused he uneasiness in many quarters and inadvertently saw the MACC is trying to mutiny against AG, who is His Majesty’s Public Prosecutor and has the constitutional power to brought forth a criminal charge against any persons. A member of the MACC Special Panel earlier mentioned on the alleged RM2.6billion donation and SRC International before it was submitted to the AG on 31 December 2015 is former IGP Tan Sri Musa Hassan. In his opinion, AG has the “Absolute right” to make the decision he announced two days ago. PUTRAJAYA: Two oversight review panels of the Malaysian Anti-Corruption Commission (MACC) have advised that the commission “engage” the Attorney-General (A-G) over the decision to close the investigations into SRC International Sdn Bhd and the RM2.6bil political donation. Former Inspector-General of Police Tan Sri Musa Hassan, who sits on MACC’s Operation Review Panel and Special Panel, refused to confirm nor deny if this meant that the MACC should not close the case as instructed by Attorney General Tan Sri Mohamed Apandi Ali. Musa clarified that the panel “can merely advise the MACC” to communicate with the A-G over the decision to close the two cases. “MACC has five independent panels that look after them, and we have no authority to engage with the A-G, what we can do is to advise, as our views represent the people,” Musa said after a five-hour meeting at the MACC headquarters on Thursday. Musa said, as far as he was concerned, Apandi, as the Attorney-General, had the “absolute power” to conduct prosecutions. “For me, we have to respect the decision of the A-G because his decisions are absolute. “But the A-G also needs to satisfy the public on his decision. That’s why we advise the MACC to engage with the A-G,” he said. On Tuesday, Apandi said documents showed that US$681mil (RM2.08bil) was transferred to Najib’s personal accounts between March 22 and April 10, 2013 from the Saudi royal family. Najib returned US$620mil (RM2.03bil) in August 2013 as the funds were not used. On SRC International, Apandi said there was no evidence that Najib had abused his position during a Cabinet meeting that approved a Government guarantee on the loan from Retirement Fund Inc, a pension fund. On Wednesday, the MACC said that it would be referring the A-G’s decision to close the cases to two independent review panels. Earlier, special operations director Datuk Bahri Mohd Zin had said that the MACC would “most likely” appeal the A-G to reconsider the decision. However the MACC Chief Commissioner was quick to react against this. Further to media reports today, I would like to state once again that the Malaysian Anti-Corruption Commission (MACC) is in no way disputing or challenging the Attorney General’s clearance of the cases against the Prime Minister. As stated yesterday, our referral to MACC’s Operations Review Panel is a standard operating procedure as part of the process of closing any case. For the sake of clarity, the Attorney General’s powers over all criminal proceedings are conferred on him by Article 145(3) of the Federal Constitution. These powers are absolute and cannot be challenged by any authority. Further to media reports today alleging MACC personnel have been giving unauthorized briefings to media and making various allegations, let me be very clear: if this is true, it will not be tolerated and action will be taken. I am instructing for a police report to be filed so this matter can be independently investigated. MACC officers must uphold the highest ethical standards and will be held to account for the oaths of office that they have sworn. Going forward, no statement by any individual should be represented by media as the official position of MACC on these cases unless it has been released by MACC’s official Strategic Communication Division upon my approval. It is high time that Chief Commissioner Abu Kassim do ‘spring cleaning’ within his own domain and weed out those senior MACC officers who have the political slant and personal opinion hindering their professional conduct. It is important for MACC to engage the public but they also have to remain professional and strategic in what they share, because even official statements could be politically adulterated. Not withstanding MACC only, this happened too many times and the current scenario in Malaysia is already causing a lot of confusion, uptightness and perception abuse and manipulation of the truth. All these in sundry does not help the nation to come together and weather off this current global economic storm, which should be the priority of all. Never before over politicking is such gross ad nauseam. After a long eight months of political roller coaster tumbles around several very sharp and precarious twists, the Attorney General finally released the statement that Prime Minister Dato’ Sri Mohd. Najib Tun Razak is cleared of criminal wrong doings in the USD681million ‘donation’ from West Asia, initially raised by WSJ and echoed by Sarawak Report. 6 JANUARY 2016 @ 12:20 PM KUALA LUMPUR: The Attorney-General’s Chambers today cleared Prime Minister Datuk Seri Najib Razak of any criminal wrongdoing in the case involving a donation from the Middle East, as well as that involving SRC International. The AG’s Chambers will also return the three investigation papers on the cases, and has instructed the Malaysian Anti-Corruption Commission (MACC) to close the IPs. In a surprise press conference this morning, Attorney-General Tan Sri Mohamed Apandi Ali said their investigation had showed that the prime minister had committed no wrongdoing in the cases. “I am satisfied that based on the evidence submitted to me by MACC, the sum of UDS681 million (RM2.08 billion) transferred into the personal account of the prime minister between March 22 to April 10 in 2013 was a personal donation from the Saudi royal family, given without any consideration. “I am satisfied that there was no evidence to show that the donation was a form of gratification given corruptly. “The evidence showed that the donation was not an inducement or reward for doing or forbearing in relation to his capacity as a prime minister,” he said. He said that investigation also showed that in Aug 2013, a sum of USD620 million (RM2.03 billion) was returned by Najib to the Saudi royal family, as the sum was not utilised. On the case of SRC International, Apandi said their investigations concluded that Najib had not committed any criminal offences under the MACC Act 2009 and the Penal Code. He said the reasons were based on evidence that the prime minister did not abuse his position during a Cabinet meeting which had approved the government guarantee on the RM4 billion loan to SRC International from Retirement Fund Inc (KWAP). Apandi also noted that the loan approval was done properly. “There is no evidence to show the prime minister had solicited or was promised any gratification from any party either before, during or after the decision was made at the Cabinet meeting.
. He said evidence also indicated that the prime minister was of the belief that all payments made to him was from a Saudi royal family donation transferred into his personal accounts earlier. Despite there are more than handful of Malaysians who wanted to believe that Prime Minister Najib did commit a white collar crime. This final closure by the Chief Public Prosecutor very much seals their hope in the wrong chest and now being given its burial at sea. Never the less, damage has already been done. The package to demonise Prime Minister Najib started from Sarawak Report’s incessant and rabid barks on the purported scandalous and dodgy financial deals by and within 1MDB. It was echoed by Opposition Leader primarily DAP Chief Strategist Tony Pua andPKR Chief Strategist Rafizi Ramli. Then came former Prime Minister Tun Dr. Mahathir Mohamad, who brought altogether a more complicated twist which left so many Malaysians even pro-BN Malay supporters dwindled in disbelief. When the Statesman lambasted Prime Minister Najib aloud in the open, the foreign media particularly those controlled by Neo-Con Jewish shelled on the Malaysian leader’s and Government position in the proportion of a major psychological war in preparation of an actual one. Let us not dwell on how obsessed the Fifth UMNO President in trying to get the Cabinet, UMNO members and eventually members of the public to rise against the sitting Prime Minister. Prime Minister Najib in a little slip here and there in general maintain his coolness to the discomfort of many of his own supporters and calmly instructed a full investigation by the authorities. The Auditor General and Parliamentary Public Accounts Committee were also tasked to investigate to the fullest, to ensure that all stones are unturned to get to the truth. In the same opportunity, to clear his name after WSJ reported that “In 2013, USD690million flowed from the Middle East into Najib Razak’s personal Ambank account”. Of course, all the investigation should be based on the laws on the land and not perception. Then there was political upheaval which saw then his own Deputy Prime Minister tan Sri Muhyiddin Mohd. Yassin coming into the stone pelting game and took pot shots, openly on UMNO platform. That was preceded by a Federal Government Cabinet reshuffle and another series of sporadic mutiny by pockets of UMNO middle level leaders and members. Prime Minister Najib faced UMNO delegates in early December and stood tall, pronouncing “The war against the detractors and those who tried to sabotage and split the unity within UMNO”. As in the infamous ‘Old Blue Eyes’ song, several lines are quite relevant to the story which already arrived to this point. Kearah Penguasa Penerbangan Awam Malaysia, Bhg 1. Dalam Malaysia bergerak kearah mencapai status negara maju dengan mengambil kira kedudukan dan geografi, data perdagangan, jumlah penumpang, kargo dan penerbangan awam, maka peranan, fungsi dan kuasa yang sedia ujud pada Jabatan Penerangan Awam (DCA) wajar dipertingkatkan sebagai Penguasa Penerbangan Awam Malaysia. DCA setakat ini berjaya mengawal selia penerbangan awam dalam ruang udara seluruh Malaysia (Semenanjung, Sabah dan Sarawak) bagi semua pesawat menggunakan laluan yang ditentukan ICAO. 1250 pengawal laluan traffik data (ATC) bertugas 24 jam bagi mengawasi laluan dan susun-atur semua pergerakan dalam dan sekeliling 24 lapangan terbang diseluruh negara. Kecekapan dan piawaian petugas ATC yang dikawal selia DCA ini dilatih melalui program-program Malaysian Aviation Academy (MAvA), yang daehulu dokenali sebagai Kolej DCA. DCA juga melalui Akta Penerbangan Awam berperanan untuk menentukan agar semua operator penerbangan awam diMalaysia dilesenkan, menurut garis panduan ICAO. Ini merangkumi keperluan bagi menentukan dan audit dibuat agar semua operasi, dokumentasi, senarai peralatan, sistem sokongan dan kakitangan adalah menurut piawaian antarabangsa. Antara sebahagian dari keperluan ini ialah isu isu kawal selia keselamatan dan risiko bagi segala peralatan, prosedur, manual dan kecekapan dan kemampuan terutama apabila berlaku kecemasan samada dilandasan atau udara. Ini penting kerana operasi bagi pesawat dimana operatornya berdaftar dan penerbangan yang bermula atau berasal dari Malaysia, perlu mendapat keyakinan bahawa ianya dibawah garispanduan dan disahkan oleh sebuah agensi penerbangan yang berkredibiliti, iaitu DCA. Kecekapan dan kemampuan warga DCA melaksana tugasan ini dengan baik menjurus kepada DCA diberikan kepercayaan untuk melatih tenaga kerja yang sama sehingga peringkat kepakaran, terutama dikalangan negara-negara kerjasama Selatan-Selatan. Jalinan kerjasama ini dipanjangkan apabila ahli ahli African Civil Aviation Commission (AFCAC) menerima latihan kawal sedia traffik dan penguasaan keselamatan di MAvA. Tanya dibiayai oleh Malaysian Technical Co-operation Program (MTCP), sebuah peruntukan oleh Kementerian Luar Negara (Wisma Putra). Ini sekaligus memanjangkan lagi skim skim pelabagai latihan yang ditawarkan pelbagai agensi Kerajaan dan GLC bagi membantu negara-negara kurang membangun. Bantuan latihan ini secara tidak langsung melunaskan sebahagian dari dasar luar negara Malaysia dipersada geo-politik global. Bahagian kedua akan membincangkan pengalaman dan sumbangan Malaysia dalan memajukan penerbangan awam antarabangsa. One may find the value of friendship and even comradeship when one is at one’s the lowest ebb. The Star summed up the story about the capital market player who is the man about town at the moment. Someone associated with Low says that he would walk the extra mile just to help a friend even with all his troubles. PETALING JAYA: Ironically, Low Thiam Hock dislikes being known by his monicker “Repco Low” which thrust him into the limelight. He has not been able to shed the nickname that has somewhat metamorphised into a term commonly used in the local stock market when stocks hit euphoric levels. Low, first emerged in the mid 1990s, when he took over this smallish car parts and lubricants company – Repco Holdings Bhd that was listed on the second board. It was just before the second board stock market run-up that started in 1996. The Malaysian stock market in the mid-1990s was the hottest stock market as there wasn’t a more speculative one in the world than the second board. The run in the second board started in 1996 and ended when the crisis came about in mid-1997. The second board companies generally had little liquidity considering that its minimum listing requirement was RM20mil. The tight liquidity caused the share price to move up to dizzy levels – mostly without fundamentals backing them up. It was also quite common to see second board stocks worth RM20, RM40 and even RM70 a share. Repco was among those that went above the normal levels – it shot up from it lowest point of a few ringgit to over RM100. Traders were also taking advantage of the long settlement period then which was T+7 (payment is seven days after buying shares) compared to the current ruling of T+3. As Repco stock price surged, so did the popularity of Low, who was Repco’s executive chairman. Repco’s rise in stock price in the mid-1990s was fuelled by proposals that the company was to take over Sabah based-Innosabah Securities Sdn Bhd – a move that did not materialise. The company then ventured into Sabah’s gaming sector to operate a four-digit game. It also announced several other ventures and all this pushed the share price very high. It was helped by the fact that during those years, a large number of stock market punters had not gone through a crash and were still hoping to make a pile after having tasted it during the 1993 KLSE bull run. Repco hit a historical high of RM140.50 per share in September 1997 but collapsed to RM2.98 less than a year later. Subsequently in 2000, the stock’s trading was suspended and de-listed three years later. Low is someone who talks very fast and sometimes it is very hard to make out what he is saying. But yet, he has a simple look and can blend in the crowd. His meeting point in the mid-1990s was the old KL Hilton Hotel and he was often surrounded by several bodyguards. Since the late 1990s, his name has not surfaced in any of the local stocks although there is always speculation of his involvement. In his heyday, punters often liked stocks that were related to Low although his name never appeared anywhere in the list of shareholders. In the process, many lost money betting on someone who they probably have never seen before. The support that Low is getting from the landmark case of persecution by the Securities Commission, which expanded over the span of 17 years, is very inspiring. The Session Court decision brought upon SC’s in what seemingly about ‘selective prosecution, is a precedence which triggered the contentious concerns by capital and financial market players. KUALA LUMPUR: The high-profile case of the Securities Commission (SC) against Low Thiam Hock that has raged on for 17 years took a fresh turn yesterday when the Sessions Court found the latter guilty of manipulating the shares of Repco Holdings Bhd. The case which epitomises the SC’s fight against stock manipulation was heard in front of about 40 people and some of them did not realise that the man found guilty was synonymous with the name “Repco Low”. In passing his verdict, Judge Mat Ghani Abdullah found Low, the former executive chairman of Repco, had failed to raise a reasonable doubt on the prosecution’s case, and that his defence only amounted to a bare denial and an afterthought. Low, 53, appeared calm when the verdict was read. Low was ordered to surrender his passport, while bail was maintained at RM300,000. A prosecutor from the SC said she was involved in the case for the past 17 years. Low, accompanied by lawyers, left the courts without speaking to reporters. Mat Ghani held that the court was satisfied that Low, through the manner of buying 227,000 units of Repco shares on Dec 3, 1997, had in fact created a misleading appearance as to the price of Repco shares on the stock exchange. He was charged in 1999 under Section 84(1) of the Securities Industry Act 1983 (SIA) after committing the offence in 1997. Under the Act, Low faces a minimum fine of RM1mil and maximum jail term of up to 10 years. The court has set Jan 19 for sentencing. Better known as Repco Low in stock market circles, Low got his nickname when he was a director of Repco, at a time when the Sabah-based gaming company’s stock was a high-flier in the 1996 second board stock market bull run. The company’s shares flew to a high of RM140.50 per share in September 1997 but collapsed to just RM2.98 less than a year later. In October 2000, the stock was suspended from trading on Bursa Malaysia and de-listed three years later. Low was charged in the Sessions Court in 1999 with allegedly instructing a representative of Sime Securities Sdn Bhd to buy Repco shares by taking up any offer price for the shares by sellers on the then Kuala Lumpur Stock Exchange. This was an act calculated to create a misleading appearance with respect to the price of Repco shares on the share market. Low, who is from Kota Kinabalu, was alleged to have committed the offence at the 21st floor of Sime Securities, Bangunan Sime Bank in Jalan Sultan Sulaiman, Kuala Lumpur on Dec 3, 1997. On Nov 14, 2006, the Sessions Court acquitted Low without ordering him to enter his defence after finding that the charge against him was defective. On Oct 15, 2010, the High Court dismissed the prosecution’s appeal and upheld Low’s acquittal. However, in 2013, following an appeal by the SC, the Court of Appeal unanimously overturned the decision by the High Court and Sessions Court to acquit Low over manipulating the price of Repco. Low was then ordered to enter his defence at the Sessions Court. Throughout the course of the 17-year case, nearly 30 witnesses were called from both sides, including stock market and stock valuation experts. Let us not add the political bit into the equation, which could be for another day. Rumours compounded through the vines are pointing towards that Low is expected to stand up against the judgment and sentencing, then many capital and financial market payers and experts would reflect how SC make the interpretation of the Capital and Securities Markets Act 2007 (CMSA). This is an interesting synopsis of the longest stock manipulation case in the country, probably the world. Low (former executive chairman of Repco Holdings Bhd) was alleged to have instructed a representative of Sime Securities Sdn Bhd to buy Repco Holdings shares by taking up any offer price of the shares by sellers on the Kuala Lumpur Stock Exchange. He committed the offence at the 21st floor of Sime Securities, Bangunan Sime Bank in Jalan Sultan Sulaiman, Kuala Lumpur between 11am and 5pm on Dec 3, 1997. February 28, 2013: The Court of Appeal here today ordered businessman Low Thiam Hock, popularly known as Repco Low, to enter his defence on a charge of share manipulation. Every old hand (and I am myself one) remembered the “Wild West” days when Repco was trading above RM 100. I still remembered a buy-recommendation from my broker (TA Securities) at around RM 110, with a price target of RM 160 (I can’t remember the exact details, but roughly these numbers should be correct). It all had to do with a lottery license which might or might not get approved. However, bubbles don’t last forever, and reality did strike, also for Repco’s share price. “At the Sessions Court, expert witnesses testified that the price of Repco, which opened at RM108.50 per lot closed at RM113 on Dec 3, 1997. The offence allegedly took place in 1997, but 16 years later the court case is still on going? Quite unbelievable. As they say, “Justice delayed is Justice denied”. The Securities Commission has initiated another case which also involved “Repco Low”, the article can be found here. “From September 2005 to May 2006, the price of Iris shares rose by 17 times from eight sen to close at a high of RM1.36 on the back of very strong demand with an average of 200 million shares being traded daily. It is believed many of the capital and financial market players in Malaysia and all over the region, would stand up for the principles that Low is standing by and for, defying the interpretation of the charge of the CMSA and rejected technicalities to explain the ‘manipulation’ bit. They would be affected too since the precedence from this case would affect them and automatically greatly impair the players to go into bourses, to acquire stocks which are offered openly in the market. Let us follow this case closely and watch what shall transpire from the details about the case. More interestingly, how the case was probably a sting operation by an authority which strategic and key personnel then were handpicked and stood loyal as imperial guards by then the monster which Prime Minister Dato’ Seri Dr Mahathir Mohamad created; Anwar bin Ibrahim. 44th United States President Barack H Obama gave an inspirational final State of the Union (SOTU) address as the President of United States (POTU), which basically sums of the foreign policy, military might supremacy, the fight against terrorism, global warming, the arrogance of the American economy and preservation of the American principle of democracy, liberty and lifestyle. It is definitely chest thumping. The mentioned about the new American was of providing the opportunity of free enterprise with the enemy, reestablish the friendship status and move on. Just like when US re-establish the diplomatic relationship with Cuba, for over 60 years. Also, the lead role in the lengthy consultancy of the Trans Pacific Partnership Agreement (TPPA). “That’s how forged the open markets in Trans Pacific, to protect workers and the environment and in advance the American leadership in Asia. It cuts the taxes for 18,000 products made in America. With TPPA, China don’t set the rules in the region. We do!”. The first black President reminded the SOTU audience about how mistreating Muslims for the wrong reasons, “When politicians insult Muslim whether abroad or our own citizens, when a mosque is vandalised or a kind is called names, it doesn’t makes us safer”. “It’s not telling them like what it is! It is just wrong! It diminishes us in the eyes of the world”. If the psy-war against UMNO-PAS political co-operation long term be detrimental to the Malaysia as the arguments that union would continue in the promotion racism and religious bigotry, then the blame should be against the Chinese Chauvinist DAP in the first place which is the consistent and continuous protagonist-provocateur on the matter for the past 50 years. An Umno-PAS alliance that uses race and religion to attack DAP would keep Prime Minister Datuk Seri Najib Razak in power for at least one more term, but this would be at the cost of the country’s stability, analysts say. They said such an alliance would give rise to a strong Malay government and a Chinese-dominated opposition. This would destabilise a multiracial country such as Malaysia, and make nation-building extremely difficult, said vice-chancellor of University of Selangor (Unisel), Datuk Dr Redzuan Othman. “This approach, whether used for the coming election or in the short term, will bring victory to Umno and PAS. But in the long run, it will not benefit the country,” said the former director of Universiti Malaya’s Centre of Democracy and Election (Umcedel). He said some people were still toying with racial sentiments and telling Chinese Malaysians to “return” to China. “This shouldn’t be happening anymore. Those notions are relics from the past, fit only to be uttered before independence. “Strangely, after 50 years of independence, people are still playing with that issue,” said Redzuan. Hisomudin Bakar (pic, right), who heads independent think-tank Ilham Centre, said PAS’s willingness to work with Umno was a huge feather in the cap for the Malay party. “It’s proven that after the issue of cooperation came up, PAS, the former main enemy of Umno is no longer attacking Umno and Najib. PAS also chose not to vote against Najib’s Budget 2016. “This signals a huge achievement for Najib and Umno, given that they have been under attack from within the party and from other opposition parties,” said Hisomudin. Hisomudin said Umno’s efforts to forge a relationship with PAS were driven by its need to overcome its internal problems, which came to a height when Najib dropped his party deputy president Tan Sri Muhyiddin Yassin and vice-president Datuk Seri Shafie Apdal from the Cabinet. “That move shook Umno, especially in Johor and Sabah. I expect at least 10 Umno seats in both the states will be affected. “By bringing in PAS, with its 21 seats, Umno is able to compensate for those losses. This is why I believe this strategy is to save Najib and defend Umno for at least one more term. “The question now is, what does PAS want from this cooperation? We already know what Umno wants,” he said. The analyses by Hisomidun and Redzuan follow the findings by Institut Darul Ehsan (IDE) that more Malays in Selangor were angry towards DAP, based on a survey conducted in November. The survey attributed anti-DAP sentiments to Umno-PAS rhetoric demonising the largely Chinese-based opposition party. Long under attack from government agencies and Umno propaganda, DAP has a new nemesis in the form of PAS, which said it was cooperating with Umno based on Islamic and national interests. PAS and DAP have been at loggerheads ever since the Islamist party decided to cut ties with its Pakatan Rakyat partner in June last year. PAS also chose not to join the new opposition coalition Pakatan Harapan comprising DAP, PKR and splinter party Parti Amanah Negara. PAS research chief Dr Zuhdi Marzuki recently claimed that Israel offered RM1.2 billion to DAP should it win the 2013 general election. Yesterday, at the Pakatan Harapan leadership convention, DAP secretary-general Lim Guan Eng said he plans to sue those who have accused him and his party of having relations with Israel. – January 10, 2016. That notion is probably relevant in the current political flavour where many issues against the fundamental values and practice of the Malay-Muslim majority is under constant attack by pockets and special interest groups of the minority. However, these issues are being echoed, magnified and manipulated with the explicit malice intent to create anguish and hatred by non other than the activists of DAP. The fact is that, UMNO-PAS co-operation was a political manoeuvre and understanding achieved by Second Prime Minister Tun Hj Abdul Razak Hussein in 1973, when Barisan Nasional was formed to replace the Alliance Party. Then mainstay of Alliance Party, UMNO-MCA-MIC expanded to accept parties in Sabah and Sarawak as component members and former Opposition PAS and Gerakan were drawn in, for the fundamental of nation building with the New Economic Policy model to address issues of the bloody racial conflict of 3GE between 10-13 May 1969. Chinese Chauvinist DAP stayed out of the whole process and continued to be the venomous thorn of anti-Muhibbah is the tones and flavour envisaged then by Tun Razak, Tun Dr. Ismail, Tun Ghazali Shafie, Tun Tan Siew Sin, Tun VT Sambanthan and other architects of then the new Federation of Malaysia. The fact is that neither UMNO nor PAS Presidents then nor now used race and religion to mount the first salvo against the Chinese Chauvinist DAP. It had been the other way around. History has proven that it is the nature of the Malays to accept immigrants into their society and allow them to be on with their own business and way of life, free from any interference. That very notion drew Chinese and Indians traders to settle down with the Malays when Melaka was the thriving economic empire in the region, over half a millennium ago. Even when the British colonialists brought large number of labourers from China and India to serve their economic and administrative interests beginning 150 years ago, on top of the colonial way of life, the Malays never tried anything ugly against the immigrants of the land of the Malays. These sundry of provocations especially on issues that would be very sensitive against the Malay-Muslim majority in various angles, spectrum, philosophy and connotations have been getting more frequent, intense and blunt. History have proven the Malay-Muslim majority even in power have never denied the Non Muslims. Yet, the nation-state then thrived, where the Non-Muslims are free to go about their business in all directions. The Malay-Muslim majority would ‘encircle their wagon’ when the Chinese Chauvinist DAP or any of their agents through various ‘likeminded intellectual entities’ use racial and religious issues to provoke Malay-Muslim majority with a sinister intent and agenda. The ‘encircling of the wagon’ is the point when the Malays stand up and state themselves aloud for the values, spirit and convention of the harmonious Malaysia as they have been living it through the over 600years of Malay-Muslim tradition and heritage, much more when it is enshrined in the Federal Constitution. Hence, Newton’s third law do apply. Quid pro quo. The tone of Attorney General Tan Sri Apandi Ali on vehement detesting the fallacy notion that his apex law enforcement agency on “Interfering or being interfered” and “Covering up” on all the investigations pertaining to the national controversy 1MDB, is reflective of his annoyance. It is against the compounding disbelieve, criticism and consistent lies that the matter have not be addressed appropriately in accordance to the law. The Bar Council President Steven Thiru is not spared. Attorney General Apandi also drew the attention about the perennial challenge confidentiality and transparency, a dilemma he is facing when the tough demands of the rakyat in their interpretation of their right to know and practice of democracy. KUALA LUMPUR: Attorney-General Tan Sri Mohamed Apandi Ali said on Friday he will study thoroughly the investigation papers on SRC International Sdn Bhd and a RM2.6-billion political donation submitted by the Malaysian Anti-Corruption Commission. He noted that evidence had been compiled from over 100 witnesses. “It’s not just one file. So I have to go through them thoroughly with a fine-tooth comb,” he told reporters at the opening of the Legal Year 2016 here. The MACC said in a statement on Dec 31 that it had submitted the investigations papers to the Attorney-General’s Chambers on that day. SRC International is a former subsidiary of 1Malaysia Development Berhad. It was placed under the Finance Ministry in 2012. In his speech, Mohamed Apandi said there must be a balance between the desire for accountability and transparency against the need for the retention of confidentiality of sensitive official information from the public eye. This, he said, was to avoid misuse, particularly in high-profile, sensitive and complex cases and issues. He reminded the audience that the Attorney-General’s Chambers, as part of the apolitical Malaysian civil service, was bound by the legal constraints of the Official Secrets Act 1972, and the Public Officers (Conduct and Discipline) Regulations 1993. It also had to adhere to internal directives as well as the specific secrecy and confidentiality provisions as contained in the laws enacted by Parliament, he said. “Regardless of this in-built reticence in engaging with the media and public directly, the Chambers and I have found ourselves compelled to do so in dealing with several high-profile and public-interest cases,” he said. Attorney General Apandi also appreciate the notion of being transparent and also implies the challenge of the burden in building the case tightly, especially against high profile individuals. Attorney-General Tan Sri Mohamed Apandi Ali said he had to balance confidentiality and public policy, amid calls for greater transparency in high profile cases. Malaysiakini reported Apandi saying that while he acknowledged public demands for transparency, there were also “standard exceptions” that he had to consider. “Transparency is not a constitutional right. Freedom of information is not a value necessary at the expense of other laws. “There are common exceptions and this includes matters pertaining to national security and foreign affairs… Hence there is a need to balance the conflicting demands of transparency and how to best serve the public interests,” Apandi was quoted as saying at the Annual Legislative Malaysia 2016 event in Kuala Lumpur today. He said the A-G was bound by the Official Secrets Act 1972. Apandi also took note of Malaysian Bar president Steven Thiru’s speech at the same event today, in which the latter criticised the sudden transfers, detentions and questioning of Malaysian Anti-Corruption Commission (MACC) officers last year during probes into alleged financial scandals involving the prime minister. The A-G, however, said while he “was tempted” to answer issues raised by the Bar, he would use “other platforms” to do so. – January 8, 2016. Earlier, Attorney General Apandi rebutted against Fourth Prime Minister Tun Dr Mahathir Mohamad on his pre-emptive strike in compounding on the doubt that the investigation RM2.6billion in donation which was allegedly credited into the account of Prime Minister Najib and SRC International. He purposely shared his doubt over media, to compound on the suspicion that all the cases pertaining to 1MDB would be sorted out appropriately through the principle, provisions and processes of the rule of law. PETALING JAYA: Attorney-General Tan Sri Mohamed Apandi Ali says he will not ignore the probe findings on the RM2.6 billion transferred into Prime Minister Datuk Seri Najib Abdul Razak’s personal bank accounts. “I will study (the cases) according to the law,” said Apandi, who vowed to act without fear or favour. He was referring to three investigation papers submitted by the Malaysian Anti-Corruption Commission (MACC) on the RM2.6 billion, and two other cases involving RM42 million relating to former 1Malaysia Development Berhad (1MDB) subsidiary SRC International Sdn Bhd. Apandi dismissed former prime minister Tun Dr Mahathir Mohamad’s “prediction” that he (Apandi) would ignore the findings, stressing that he would act fairly and thoroughly. Mahathir had said that Apandi would disregard the MACC’s investigation papers on the RM2.6 billion and RM42 million from SRC International, which allegedly found their way into Najib’s personal bank account. Mahathir has also dismissed the argument that the RM2.6 billion transferred ahead of the last general election in 2013 was a donation from a Middle Eastern source, whose identity continues to remain a mystery. He said Mahathir should cease resorting to such tactics. “He just tries to put pressure on me. I don’t work under pressure. Just like any judge, we don’t work under pressure,” said Apandi. He also denied speculation that he was appointed to protect Najib. Apandi became attorney-general after his predecessor Tan Sri Abdul Gani Patail was suddenly dropped from the post due to health reasons last year. The latter’s sudden removal from office ignited speculation that he was on the verge of hauling the prime minister to court. Najib, who has denied any wrongdoing, also replaced his deputy Tan Sri Muhyiddin Yassin and Rural and Regional Development minister Datuk Seri Mohd Shafie Apdal, who were critical of the 1MDB issue. This was in response on Tun Dr. Mahathir Mohamad’s remark to cast the doubt on Attorney General Chambers ability to investigate and build the case against the RM2.6billion donation and SRC International. Former Prime Minister says this is due to the Attorney-General’s previous rejection of Bank Negara’s report and recommendations on 1MDB. PUTRAJAYA: If Attorney-General (AG) Apandi Ali could reject Bank Negara Malaysia’s (BNM) report on 1Malaysia Development Berhad (1MDB) earlier, the same thing would likely happen again now that the Malaysian Anti-Corruption Commission (MACC) has submitted its report on SRC International and the controversial RM2.6 billion political donation. In an exclusive interview with FMT, former premier Dr Mahathir Mohamad predicted Apandi would once again ignore the investigation papers on the scandals although the report was submitted by a relevant authority. “I think he (Apandi) will reject it (MACC’s report) too. But this is just my prediction,” he said when met at his office at Perdana Leadership Foundation, here yesterday. Mahathir made this prediction following Apandi’s earlier rejection of BNM’s recommendations for action to be taken against debt-ridden 1MDB, after finding no wrongdoing had been committed by any of the state-owned firm’s officials. “I believe the Bank Negara had submitted their report (on 1MDB) before and Bank Negara is not some institution without rules. “They made detailed investigation on it and had certain evidence which required the case be brought to court. But the AG rejected it blindly. On December 31, the MACC announced that they had submitted three investigation papers to the AG – two papers related to the probe on SRC International, a former subsidiary of 1MDB, and another on the RM2.6 billion political donation. On July last year, international news agency the Wall Street Journal (WSJ) revealed that RM2.6 billion was channeled into Prime Minister Najib Razak’s personal bank accounts, and that the funds were allegedly channeled from 1MDB. The MACC however denied the allegation saying the money was in fact a donation made to Najib by an Arab from the Middle-East to help Barisan Nasional (BN) win the General Election in 2013. It was part of the bigger 1MDB ultra controversial case with the Fourth Prime Minister used as the primary basis to mount an attack and charge for Prime Minister Najib, in the strategy for the Sixth Prime Minister be ousted from office. KUALA LUMPUR, Aug 20 ― Prime Minister Datuk Seri Najib Razak did not influence the Attorney-General’s Chambers (AGC) investigations into 1Malaysia Development Berhad (1MDB), Tan Sri Mohamed Apandi Ali has said. The Barisan Nasional Backbenchers Club (BNBBC) portal quoted the AG as saying that the investigations into the state investment firm would be conducted professionally and legally. “We are free (from influence), we will act in accordance with the law,” Apandi reportedly said. He added that the AGC was currently examining the findings of Bank Negara Malaysia’s (BNM) probe into 1MDB. “We are still studying the papers. I have no comment. The papers was handed to us late in the evening or before 5pm on the same day Bank Negara Governor (Tan Sri Dr Zeti Akhtar Aziz) had a press conference,” Apandi said. Last Thursday, Zeti told a press conference that BNM’s had concluded its probe on the state investment firm and that its findings have been submitted to the AGC. Zeti also noted that the bank’s findings are the culmination of several years’ worth of prior informal monitoring of 1MDB’s investment activities, which she said has required BNM to follow closely as the firm was highly geared. The BNM chief stressed, however, that the bank cannot publicly discuss the contents of the report submitted to the AG, though she did say it had to do with information on the relevant accounts shared by local banks and the central bank’s international counterparts. In early June, Bank Negara announced that it had launched a formal inquiry on 1MDB’s activities to establish if there were any contraventions to the country’s financial rules and regulations. The investigation included taking statements from individuals involved in the governance process and obtaining information from other relevant domestic and foreign parties. Apandi replaced Tan Sri Abdul Gani Patail as Attorney-General last month, after the latter was removed for health reasons. It is responsible for Attorney General Apandi to stand up and make his position very firmly, especially all the allegations is against Prime Minister Najib and the burden to do a thorough investigation and build a really water tight case is of paramount national interest. 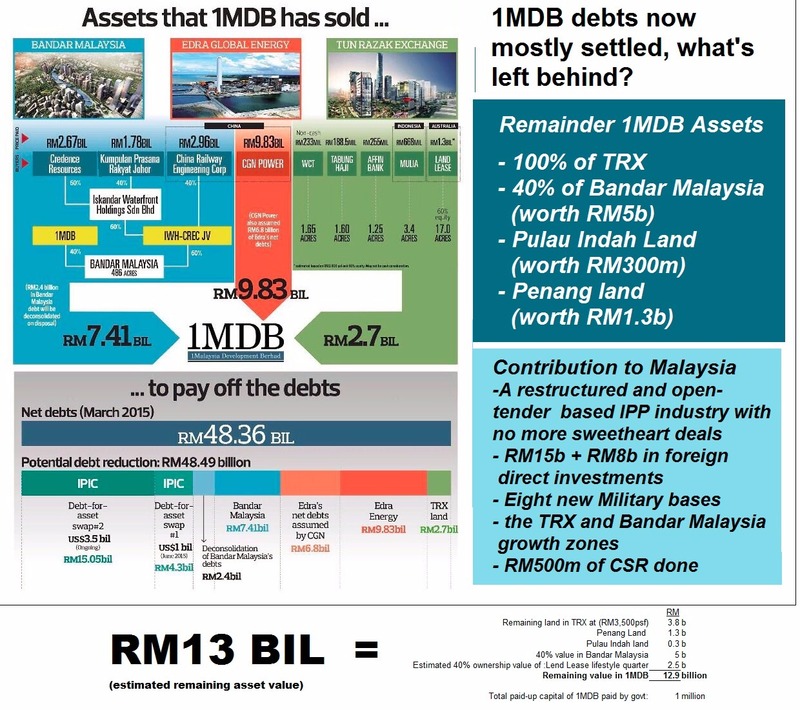 The controversial RM42billion borrowings which was stated in the strategic investment corporation’s 31 March 2014 annual report but instead proclaimed by Tun Dr. Mahathir Mohamad in April 2015 in first open attack against Prime Minister Najib using the 1MDB as a basis of demonisation, “RM42billion is missing”. In has since been proven to not true. Now, almost all of the debts have either been resolved and swapped to investments. 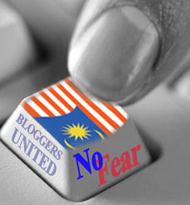 The Opposition, pro-Opposition NGOs in the likes of Bar Council, Suaram, BERSIH, Tun Dr. Mahathir Mohamad and small pockets of rebels within UMNO, pro-Opposition and the concerted spectrum of foreign media, working in tandem with utmost consistency, perseverance and intensity, especially in the strategy to demonise Prime Minister Najib, is very revealing. It is the time for everyone to put their personal and political interest aside and come together as nation is in peril, mainly due to unavoidable external factors such as the sundry of global economic recession, escalating geo-political conflict, low global demands, sluggish global financial and capital markets. PUTRAJAYA: The 2016 Budget will be adjusted soon, taking into account the current global economic developments. Announcing this today, Prime Minister Datuk Seri Najib Razak said the strengthening of the US dollar, plummeting oil prices and major commodities, as well as the shrinking of major economies such as China, were among the factors taken into consideration. “When I tabled the 2016 Budget, oil prices were at US$48 a barrel. Yesterday, the price was US$31.58. “As such, the 2016 Budget will have to undergo a recalibration in line with the current economic situation. “I do not want to paint an unrealistic picture that isn’t based on facts. “It is better to be honest and upfront in our responsibility to uphold the best interests of the rakyat,” he said in a special assembly with Finance Ministry staff this morning. Najib, who is also Finance Minister, described 2016 as a challenging year, especially in terms of the economy. He said the Goods and Services Tax (GST) net revenue for 2016 is expected to reach RM39 billion. Najib said had the GST not been implemented, Malaysia’s deficit would increase to 4.8 per cent instead of 3.1 per cent this year. PUTRAJAYA: The 2016 Budget will be “recalibrated” to reflect the current eco‎nomic climate, says Datuk Seri Najib Tun Razak. The Prime Minister said that adjustments would have to be made to this year’s budget as much had changed since it was tabled last October. “This is to ensure that it is accurate, realistic and according to the economic situation we are currently facing,” he said when addressing Finance Ministry staff on Friday. Najib, however, did not give a specific date when the adjusted Budget would be presented, but indicated that this would be done soon. The changes would include additional measures to be taken to optimise expenditure and the role of Government-linked companies. The Prime Minister assured that despite the adjustments to the 2016 Budget, the people’s well-being would continue to be the Government’s priority. The nation needs the resources, energy and attention of everyone. The Government is preparing to realign the planned economy 2016, which needed to take into the consideration all the volatility and changes in the variables. The firms, enterprises and commercial entities must do their bit to ensure the Government is successful in bracing the the economic crunch. Despited the forecast GDP growth is still good, the slide of earlier projected GDP growth with revision from 4.5-4.8% to 3.1-3.4% is telling about the brunt on the Federal Government income. When Budget 2015 was prepared before Oct 2015, it was projected the crude oil would be at USD48.00 per barrel. Today, the Federal Government is ready to a revised projection of a barrel of crude oil for USD32-35.00. That would translate to a reduction of revenue for the Federal Government by RM4.5billion. Federal Government is committed that existing essential subsidies such as a list of food items, medicines, gas for energy, oil and other subsistence such as BR1M and other programs, shall not be reduced. Prime Minister Najib did ask all Federal Government arms to look into reduction of spending and lowering cost of operation, without impairing service especially to the rakyat. Hence, the reduction of income would naturally be mitigated with trying into increase revenue from heightening productivity of economic activities, other direct and indirect taxes and lowering spending (such as allowing concession holders to increase charges in lieu of compensation). On top of that, utilising reserves to reduce and treatment against long term financial commitments. Improving the collection of revenue would definitely help and tight controls against leakages, wastage and excesses would be the combined compounded variables towards a more positive position of the Treasury coffer. Tighter enforcement is a boon for revenue of regulators, local authorities, law enforcement agencies and all revenue collection entities be it in the Federal or State Governments. In all, it is a responsibility of all. Politicians (ruling, opposition and independent), civil servants, GLCs, MNCs, private sectors, SMEs/SMIs, petty traders, workers union, all and sundry to pull up their socks.